Home » Diabetes Tips » Kombucha for Diabetes! Does It Work? Kombucha for Diabetes! Does It Work? The potential benefits of kombucha for diabetes may come as a surprise to you. This naturally sweet beverage might seem like it would send blood sugar skyrocketing, but depending on how it’s made, kombucha could do the opposite and more. Diabetes management, improved gut health, and abundant antioxidants and probiotics are just some of the reported benefits of the health drink, and much of those are rooted in science. Kombucha is a fizzy, fermented beverage that’s typically made from black tea and sugar. The tea and sugar (usually derived from honey or sugar cane) are brewed with a symbiotic colony of bacteria and yeast (SCOBY) and left to ferment. The sugar content, which likely makes you suspect that kombucha tea and diabetes are not the best pairing, is minimal (about four grams) and required for the fermentation process. This is what gives kombucha its probiotic capabilities and thus a number of its health benefits. So, kombucha and diabetes can be a safe mix. The good bacteria in the drink are known to produce cellulose, which can help protect your cells. When you swap the black tea for a green tea kombucha, blood sugar should not spike. Green tea is associated with a lower risk of diabetes overall, and therefore may be a smarter option. Kombucha keeps your blood sugar levels within a normal range. It normalizes high blood pressure and improves cholesterol levels. The drink improves your metabolism and energy levels, which benefits the digestive system. The Journal of Indian Society of Periodontology published an article stating that kombucha can actually prevent, or even cure periodontal disease, which is a disease that diabetics are at a higher risk of obtaining. The fizziness of the drink is a big factor in its appeal, making it a great replacement for soda. If you’re asking, “Is kombucha safe for diabetics?” this is definitely something to consider. Having a cup of kombucha can satisfy the craving for fizz without taking in a huge, fast hit of sugar. Just make sure you select an option that hasn’t had a lot of sugar added to it. When made from green tea, the polyphenol content of kombucha may aid in battling chronic inflammation, a problem encountered by diabetics. Studies in rats have shown that kombucha slows the digestion of carbohydrates and reduces blood sugar levels. Research in rats has also shown that it improves liver and kidney function. As mentioned, green tea may present a more healthful way to consume kombucha because of its high level of antioxidant polyphenols. These antioxidant capabilities can help keep inflammation under control, while green tea is also noted to have other unique benefits. They include a faster metabolism (that can help utilize carbohydrates), decreased belly fat (common in diabetics), better blood sugar control, and improved cholesterol profiles. A large-scale study of 300,000 people also found that green tea drinkers have an 18% lower risk of diabetes. In some cases, consuming kombucha can lead to an allergic reaction or stomach complications. 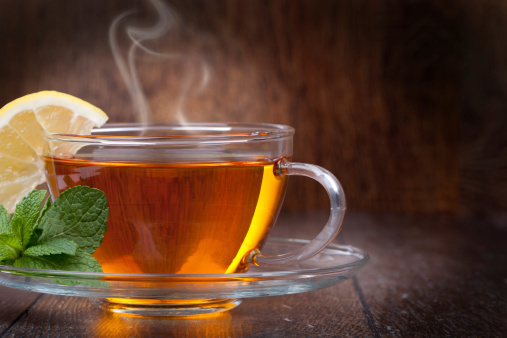 Brewing kombucha tea can produce a toxic reaction with the elements that are in the teapot, which can also lead to severe complications to your health. Always make sure your teapot is as clean as possible to minimize the risk. Make sure all the equipment you use is washed thoroughly and sterilized. If you purchase farmed kombucha, there is the risk that it could be contaminated with other chemicals, which can affect your health. The best place to purchase kombucha is from an organic food market or a specialty food store. In 1995, the Centers for Disease Control and Prevention released a statement stating that an Iowa woman died due to an unexplained illness—some doctors suggested it was due to her daily consumption of kombucha tea. The acidity of kombucha may lead to some damage to your tooth enamel if consumed regularly. To mitigate the risk, swish some water around your mouth after drinking. A small percentage of people who consume kombucha may experience some bloating, nausea, infection, or allergic reaction. Because kombucha is acidic, it may create some discomfort in people who regularly suffer from stomach ulcers or heartburn (acid reflux). People who have a compromised immune system, such as those with HIV or another autoimmune disease, may want to exercise caution with kombucha. It is possible that it could lead to the proliferation of harmful bacteria. Pregnant women should also talk to their doctor before consuming the drink, as it does contain amounts of caffeine and alcohol. Despite the complications, albeit unlikely, that can occur from kombucha, it still provides significant improvements for those with diabetes. As always, make sure to consult with your doctor before making any changes or additions to your diet. Can diabetics drink kombucha? Yes, they can. Although I wouldn’t say that drinking kombucha is a “must,” or that it should be central in your fight against diabetes, there is enough evidence to suggest that it may be a good alternative for people craving fizzy beverages. The combination of vinegar, B vitamins, enzymes, probiotics, and a high concentration of acid (gluconic, acetic, and lactic) appears to have a positive effect on the metabolism and digestive system, which could in turn help stabilize blood sugar levels. The important thing to consider, when buying it from a store, is how much sugar is added to the kombucha. Blood sugar levels can skyrocket if there is more sugar added beyond the fermentation process, so that is extremely important to note. Because of its probiotic capabilities, it may be something worth considering to boost your overall consumption of healthy foods and add to a healthy diet. Ogunjimi, A. “Kombucha and Diabetes,” Livestrong.com, February 10, 2014; http://www.livestrong.com/article/531073-kombucha-and-diabetes/. McQuillan, S., “Kombucha: Is It a Healthy Drink for People with Diabetes?”OnTrackDiabetes,” last accessed January 9, 2018; https://www.ontrackdiabetes.com/live-well/eat-well/kombucha-it-healthy-drink-people-diabetes. “What is Kombucha?” What Is Kombucha,” last accessed January 9, 2018; http://whatiskombucha.org. Dutta, D. and Gachhui, R., “Nitrogen-fixing and cellulose-producing Gluconacetobacter kombuchae sp. nov., isolated from Kombucha tea,” International Journal of Systematic and Evolutionary Microbiology, Feb. 2007; 57 (2): 353-357; doi: 10.1099/ijs.0.64638-0/. Marsh, A., et al., “Sequence-based analysis of the bacterial and fungal compositions of multiple kombucha (tea fungus) samples,” Food Microbiology, Apr. 2014; 38:171-178; doi: 10.1016/j.fm.2013.09.003. Campbell, A., “A Twist on ‘Tea’,” Diabetes Self-Management, March 25, 2013; https://www.diabetesselfmanagement.com/blog/a-twist-on-tea/.